"quality of food is still poor"
✅ Trip Verified | As it seems the Copenhagen lounge remodelling is almost finished and I am not impressed. They added a Barrista and coffee bar, but the choice and quality of food is still poor and below average: warm curry soup, bread and salad. That`s it! Soft drinks, wine and some strong alcohol. New furniture and design are stylish. 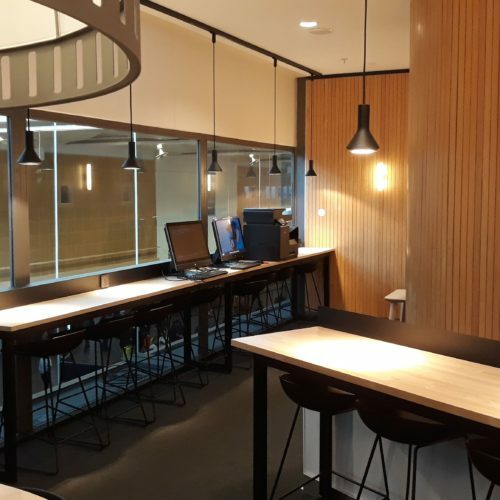 ✅ Trip Verified | The lounge of SAS is tucked away on second floor in a secluded part of the airport, not exactly easy to find eve for a seasoned traveler like me. The lounge is split into two part, one for business class tickets, one for all the Star alliance Gold members. Typical Scandinavian touch with the use of wood and stylish furniture. Overall it was pleasant enough. However a very limited selections of food on offer. At noon, only a soup and salads that's all. Alcohol selections was not too bad though. On the other hand, the star alliance part of the lounge had a bit more offering and better seating and designs. SAS seems to value Star alliance members more than their own full fare paying business class customers, that's the part which really disappointed me. The toilets, I am not sure if it's a typical Swedish thing, are all individual cubicles without regards whether you are male or female. I find the whole experience rather underwhelming. 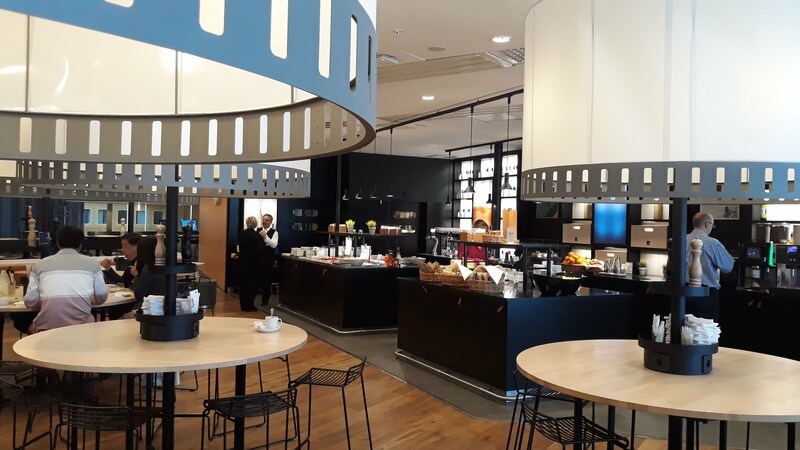 "everything in a Scandinavian design"
✅ Trip Verified | As a premium economy traveler you are entitled to use the new lounge only at Arlanda airport, when flying Scandinavian so I said to give it a try. It turns out it is located where the business lounge is, but it uses another gate, for premium travelers and they get a different experience. It was indeed new and it looked great in a nice Scandinavian design. The only thing is that the bottles on the walls were for decorations only and water was coming from the tap. same with the juices or beer or even wine. 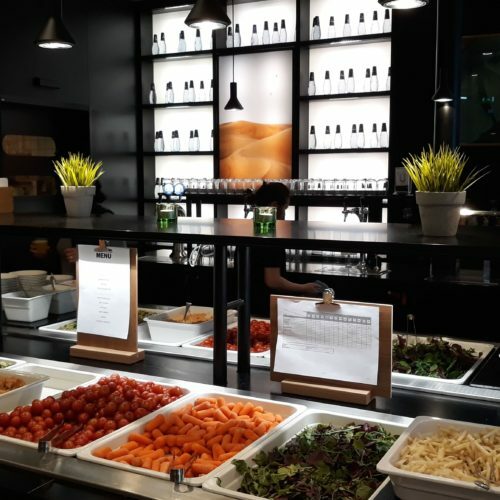 The food selection was better being focused on a healthy way of living with fresh fruits and vegetables which you could combine from the buffet in a lovely salad. They were accompanied by some crackers cheese and so on, but not much. It had a business desk where one could use a computer and there was a printer too. There were plenty of chairs and tables, but the place was small and they were somehow squeezed inside. Round tables, small tables, armchairs, it had it everything in a Scandinavian design. Not the best place for getting a drink before your flight, but better than waiting at the gate. Also check your time because it is located in the Schengen area, so going to your gate for long haul means going through security and passport control. "miserable excuse for a lounge"
✅ Verified Review | What a miserable excuse for a lounge! I have used the SAS domestic lounge in Stockholm many times. It is a small lounge that gets very crowded to the point of standing room only especially at late afternoon. The seating is in groups around tables, plus there a a couple of counters. The furniture is worn and very, very dated. There is no food to speak of in the lounge. There are potato crisps, cookies, and usually a non-descript soup that tastes as if it came directly from a can (which it probably does). Plates and utensils are plastic and paper. Drinks are limited to soda, beer, coffee and water. The worst part about the lounge is how dirty it is. Paper plates and plastic cups are left for hours on the tables before the never visible staff finally collects them. The restrooms probably only get cleaned once a day. Waste bins are overflowing with paper towels. There are no showers. The only positive aspect is that the wi-fi is ok. It is really a pretty misserable place. The only reason to use it is that the domestic terminal itself also can be a pretty misserable experience during peak times, and then it is a question of choosing the lesser of two evils. 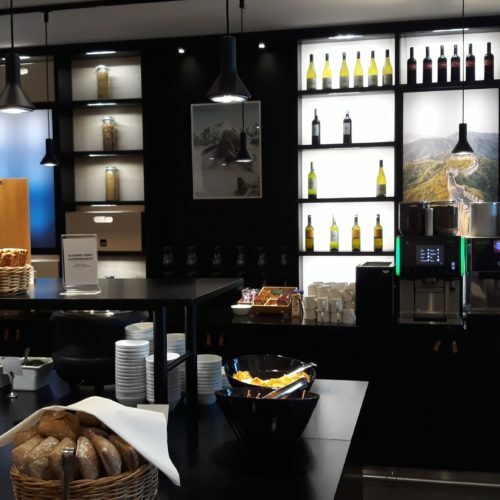 "would even pay to get some choice"
✅ Verified Review | The SAS Business Lounge offers you one kind of red wine, one kind of white and one beer. That’s it for the alcoholic drinks. The food is a joke, Hot Dogs - seriously. I’m at a point where I would even pay to get some choice. 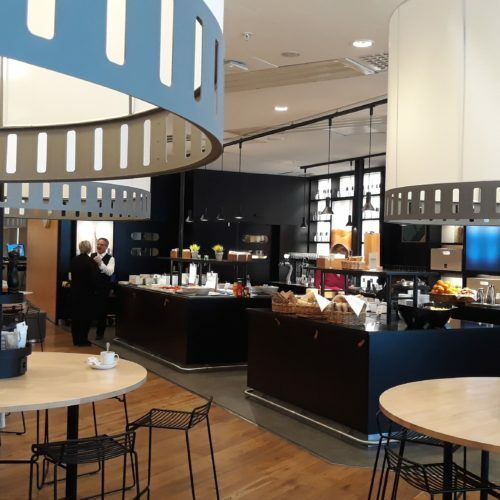 There’s a CPH apartment lounge in the airport where you get at least a decent choice of drinks - the comfort is a joke too as you can chose between sitting in the departure area style environment or on uncomfortable high chairs or some soft seating that is always taken. The only upside is the friendly staff. ✅ Verified Review | Flying Thai Airways and using SAS lounge. Cask (bag and box) wine and one choice of beer (everyday brand). Crummy cheap in the extreme in the SAS home lounge. We were there at lunch time, and the selection of food was, to say the least, meager. This was a most disappointing experience. The WiFi was also annoying, requiring a long and convoluted logon process. ✅ Verified Review | I was looking forward relaxing in the Gold lounge in Copenhagen operated by SAS. The experience was very disappointing. Limited selection of food and in a desperate cost saving attempt all news papers had been removed and replaced by electronic copies which to access you needed to install an app. Bad experience. I can understand it as a value add a supplement to the physical news papers but as a replacement. Shame on your SAS. A relaxing lounge with understated Scandinavian design. It has a nice assortment of snacks and beverages. Alcoholic drinks are not served before 7am and only wine and beer until noon. Spirits are available in the afternoon so that may be a little unusual for the international traveler. Staff are courteous and efficient. Overall a nice place to regroup before a flight. ✅ Verified Review | This Aspire handling lounge was very poorly maintained. It was overcrowded, dirty, and the receptionists were not very friendly. The tables were laden with empty glasses and dishes and people had a hard time finding a place to sit. For a Business Class lounge, it really does make the cut. "Hot, cramped, few free seats"
✅ Verified Review | Hot, cramped, few free seats and those that were were uncomfortable. Lounge open to main terminal so noisy. Lousy food selection as well. first and last time I shall be flying SAS.